It took a long time, after decades of jewelry making, to become interested in the Lapidary. 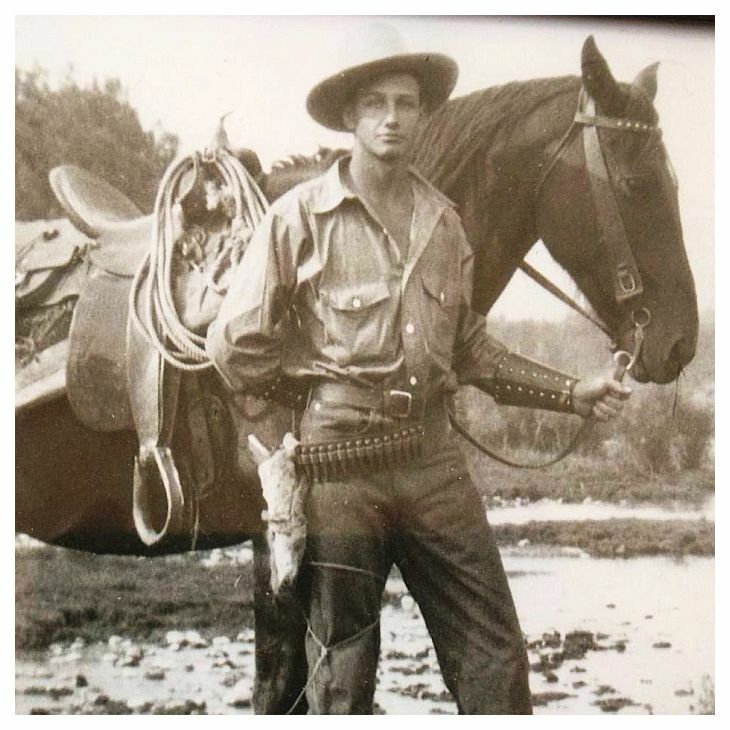 My Grandfather did it. My mom did it. As for me, I just figured I'd buy the pretties at the gem shows and cut to the chase with the fun of the jewelry making. Stone finding was always fun but the polishing really seemed like the dirty work. So yeah, this was the guy who first taught me to solder. I made my first ring in the upstairs loft of his machine shop. Lapidary is rough, this guy didn't seem to mind at all. I really really learned to love rough (insert rock hound pun there). Some people see a rock here. Other people wonder how many different, incredible worlds reside inside this piece of 'rough'. 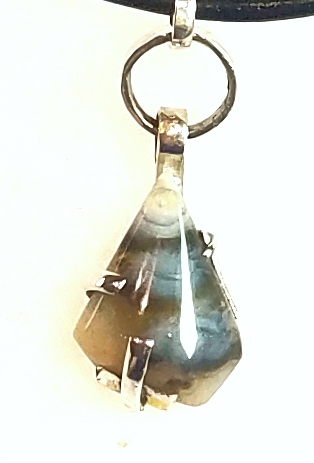 Blue agate co-mingles with red striations of mineral. Plumes of white, black, yellows, reds, and even green with Marcasite dance through changing hues and rippling of the agate. Top it all off with some Druzy Quartz pockets of fun and I just went weak in the knees. Lapidary artists typically use tools and machines to polish the stones by hand (instead of tumbling or other method where one loses control of the stone). I like to literally hold on to the stone while shaping and polishing it. This leads to not having finger nails and sometimes finger prints as well. A method of holding the stone, especially when it's too small for fingers, is called 'dopping'. These are a bouquet of dopped stones just finishing polish. Those of you who have been in the gallery when I said I would never dop, well, that day has come. Come see what jewelry happens with these little guys and what happens to the big piece of rough in my hand that has become much smaller and pretty amazing. In the past, I have hated making earrings. It's strong vernacular, but doing anything twice goes against my creative, artistic grain. In the creation of the earrings in the latest body of work, an element of the distaste has completely vanished. 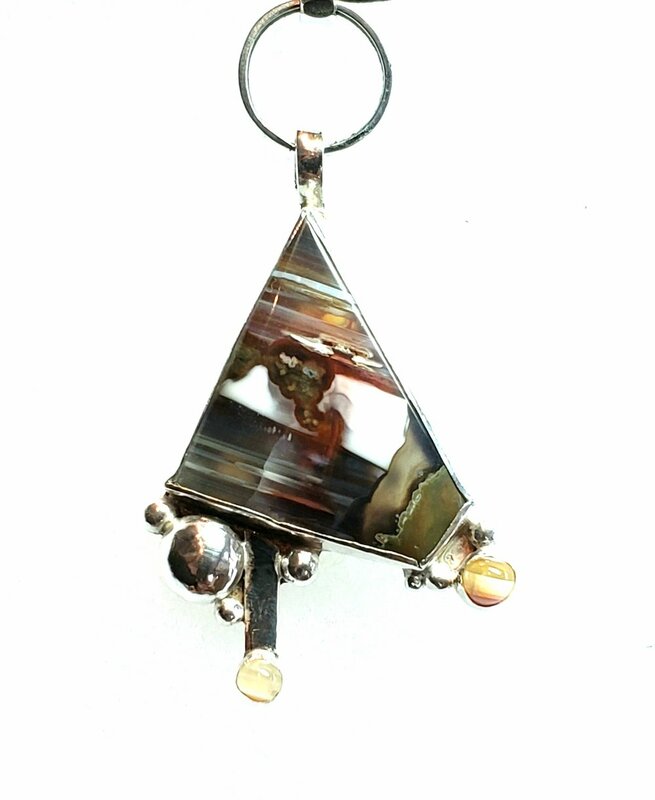 Because of the raw and asymmetrical nature of the metal-smithing, each piece gets to be a stand alone exploration into texture, mixing of metals, shapes, and sculptural concepts. Long story short; now it's fun and not so much like pulling teeth. This pair of earrings, fresh off the bench, were a pleasure to create. I had not tried the exact way of engraving before, I hadn't blended the patina black silver with the Keum Boo in this way before, I hadn't floated black pearls out in front of anything like this before either. The trip into the frontier was akin to the deep sea diving for those pearls of wisdom these earrings visually represent to me. They're little slices of the big, deep sea garnering the little gifts to be found. Those who have been to the gallery have met me (Karen Britt) most likely. Many days I am pinned behind my bench-pin sitting low at my jewelry work-haven at work. Today, a visitor to the gallery and I were equally startled by each other as I was deep in focus (on the earrings in the thumbnail) while they quietly snuck up on the jewelry counter not noticing me either. We were both in our own 'zone' and galleries are good 'zoney' places. 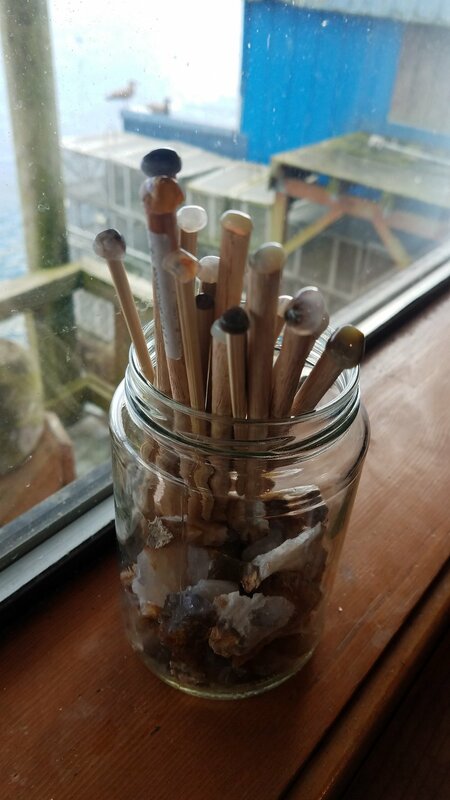 On the pretty days, I am out on the landing overlooking the Yaquina Bay polishing stones and doing the dirty work on the finishing of the jewelry pieces (getting a tan). Keum Boo is an Ancient Korean method of fusing Gold (23.5k) to Fine Silver (99.9). For more information about the history, google is awesome. My mom learned to do it decades ago and I was instantly jealous though it took me many years to catch up to her. One uses heat and friction to create a mechanical bond between the two metals without solder. The result is a terrain-change-free blending of the two. Often, the fine silver is hammered or textured before the application of the gold to give it topography from which to glimmer and glow. In addition, one may opt to 'patina' the silver with Liver of Sulfur (potassium sulfide) for a bluish-black contrast to the gold that does not oxidize. All these results are delicious, inspiring, and somewhat habit forming. The earrings in the thumbnail are actually an amalgam of 4 metals (going for the mega-mixed-metals award). 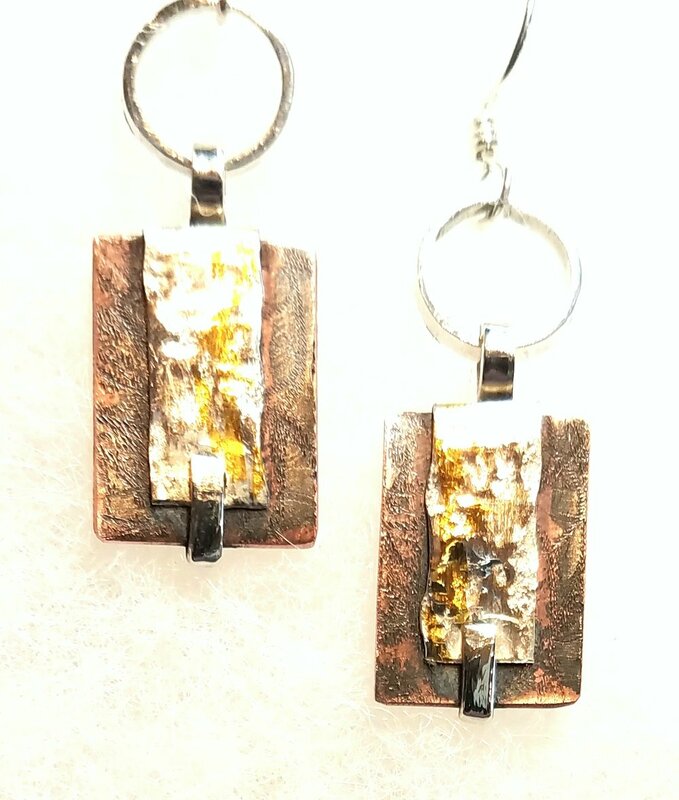 The platforms are copper textured and treated with patina, overlaid with hammered fine silver and gold Keum Boo, the prongs, loops, and earring wires are sterling silver. The harmony and contrast of hues and textures are the goal. Keum Boo is touching many of the pieces in the jewelry counter as of late. See it on the stone necklaces, rings, bracelets, earrings, and even dare I say it, some pieces of art on the walls! Check out the New Jewelry Gallery for the latest pieces.